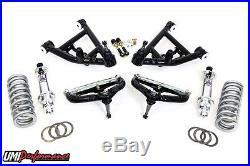 UMI Performance 78-88 GM G-Body Competition Front End Kit 650lbs Spring/Street. 78-88 GM G-Body Competition Front End Kit, 650lb Springs, Street. P/N: 3059-650 Color/Finish BLACK Powdercoat. 1978 - 1988 Chevrolet Monte Carlo, Malibu, El Camino 1978 - 1988 Buick Regal, Grand National 1978 - 1988 Pontiac Grand Prix, LeMans 1978 - 1988 Oldsmobile Cutlass. Proudly made in the USA by UMI Performance Inc. Tremendous front grip and a host of features can be yours with UMIs complete front end Grip Kit. The included a-arm kit enables 10 degrees caster while maintaining standard track width and wheelbase. Lower a-arms are assembled with tall lower ball joints to optimize roll center, camber gain, center of gravity and lowers ride height by an additional. Lower a-arms feature Delrin bushings for smooth travel and bind free performance. The new lower a-arm works in conjunction with the included adjustable upper arm which features minimum shim adjustability, 1 taller-than-stock ball joints and super smooth Teflon lined rod ends. The front sway bar attaches using UMIs swivel style end link design and double shear mounting system. The included Viking Crusader coilover shocks mount to the lower a-arm in double shear quick change brackets. The lower shock mount is removable to allow spring and shock changes at the track. UMIs kit features Viking Crusader shocks with AT pro-touring valving (high rebound tie down for road race and auto-x) and a true 2-1/2 racing coilover. The upper stud mount fits in factory location while the lower is optimized to fit UMIs new and included 3057-1 competition lower a-arm. Some grinding is required for installation in the upper frame spring bucket. This kit is intended for use on competition vehicles and develops a ton of grip. Other spring rates and valve codes are available. Battle tested on the iconic UMI Green Machine. Kit is available in UMI red or black powder coat. 100% designed, manufactured and raced with pride in the USA. Performance note: UMI recommends adding the P/N 3060 bump steer kit for optimal performance. Total of 10 degrees caster potential while maintaining spindle pin location. Adds 1-1/2 of height to factory spindles. Upper ball joint moved rearward to add 5-6 degrees caster potential. Lower ball joint relocated forward to increase caster 4-5 degrees which improves steering feel and straight line stability. Viking double adjustable Crusader coilover shocks with pro-touring valving. Ride height adjustment using coilover shocks. Rod ends feature superior friction reduction for quick response. Adjustable upper a-arm uses rod ends for easy alignment. UMI built Delrin bushings improve steering response and reduce deflection. Taller upper ball joints to improve camber gain, optimize roll center and improve traction during cornering. Upper and lower a-arms built from USA Made DOM steel tubing. Removable double shear mount to allow spring/shock replacement without removing spindle. Mount spacing suitable for Afco, Viking, Ridetech and many other aftermarket manufacturers shock/spring combos. Double shear swivel sway bar mounts and hardware work with UMI P/N 3035 and most other factory eyelet style sway bars. P/N 3057-1 Coilover lower a-arms, taller ball joints, Delrin, quick change shock. P/N 3056-3- adjustable upper a-arms, 1 taller ball joints, rod ends. (2) Viking Crusader double adjustable shocks, AT pro-touring valving. (2) Front springs, 650lb rate for race use and good street manners. Thrust bearing kit for easy height adjustments. The item "UMI Performance 78-88 GM G-Body Competition Front End Kit 650lbs Spring/Street" is in sale since Tuesday, March 14, 2017. This item is in the category "eBay Motors\Parts & Accessories\Car & Truck Parts\Suspension & Steering\Control Arms & Parts". The seller is "umiperformance" and is located in Philipsburg, Pennsylvania. This item can be shipped to United States, United Kingdom, Denmark, Romania, Slovakia, Bulgaria, Czech republic, Finland, Hungary, Latvia, Lithuania, Malta, Estonia, Australia, Greece, Portugal, Cyprus, Slovenia, Japan, Sweden, South Korea, Indonesia, South africa, Thailand, Belgium, France, Hong Kong, Ireland, Netherlands, Poland, Spain, Italy, Germany, Austria, Mexico, New Zealand, Singapore, Switzerland, Norway, Saudi arabia, Ukraine, United arab emirates, Qatar, Kuwait, Bahrain, Croatia, Malaysia, Brazil, Colombia, Panama, Jamaica, Bahamas, Viet nam.